ABILITY TO REMOVE RESIDUE AND FOULING. USABILITY FOR ANY CALIBER FIREARM. The cost effectiveness of this kit is far superior than others on the market. Being affordable, long lasting and with superior cleaning power, your gun will thank you for using ΩMEGA. To accommodate firearms of different calibers, and clean the various internal parts, we supply three different sized patches: 2x2, 2x1 and 1x1 so you're never out of options. In addition, two different materials are provided for their different absorption and cleaning properties: high thread count cotton and soft synthetic patches. Both materials are machined cut and have been produced specifically for this purpose. 5 Mil heavy duty powder free black nitrile gloves are provided to protect your hands. These will withhold the stresses of rubbing and cleaning and prevent oil and lubrication from coming in contact with your skin. Gloves made from the same soft synthetic material as the patches are provided to make the first pass at wiping residue and fouling easier. Cleaning is as easy as holding the part in your hand. Made from a high strength polymer, four lightweight picks each with two uniquely shaped tips offer eight different cleaning options to cover all nooks, crannies, ridges and spaces. These picks will not scratch surfaces and will not damage the parts that are being cleaned. To compensate for different cleaning scenarios, 3 double-edged brushes, each with different bristles (nylon, brass and stainless steel) can be used to scrub away residue in hard to reach places. Use the nylon or brass brushes to prevent scratches on your firearms. The steel brush can be used on surfaces that are not prone to scratches. 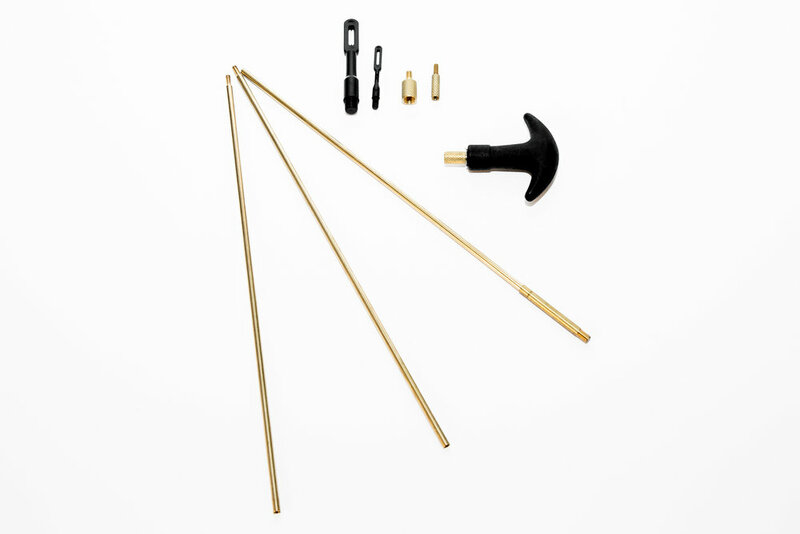 The cleaning rod set consists of a free rotating handle, two adapters, two high strength polymer patch holders and three brass rods. The length of the rod can be customized to suit any length barrel from pistols to long range rifles to shotguns. The polymer patch holders will not scratch the bore to protect the surfaces whether rifled or smooth. The extra plush and ultra soft microfiber towel is perfect to wipe the exterior of the gun to remove fingerprints, excess oils, sweat and dirt. These towels are scratch free and lint free and can easily be thrown in the washing machine. Extremely versatile for cleaning the exterior to polish and shine, or you can use to clean the interior components as well. Use as desired and needed. These paper towels are not your ordinary kitchen variety. These were designed specifically pick up grease and grime while not tearing or leaving lint behind. You'll wonder how you ever cleaned without these and will never clean without them again! Cleaning to us does not just mean cleaning your guns. It also means protecting your working environment and surfaces so you don't have to clean after you clean. 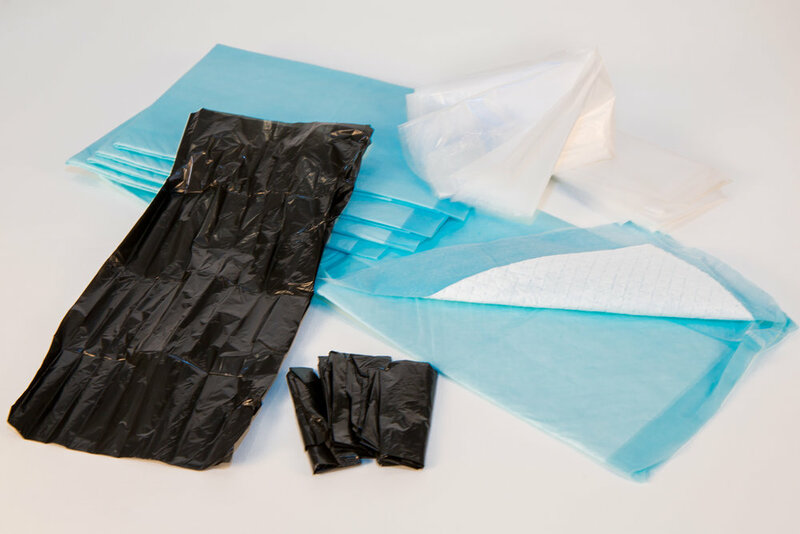 Two layers of protective sheets ensure fouling and residue do not come in contact with any surfaces while a solvent absorbing layer protects against leaks and spillage of oils. Trash bags are also conveniently included so everything can be disposed of easily. An ultra soft pipe cleaner can be used to clean or coat with lubricant in tight spaces. An extra long cotton swab with a sharpened point on the other side can serve to scrape, wipe, coat and clean. A razorblade, while seemingly out of place, can be used to scrape off stubborn residue and fouling especially if your gun has not been cleaned for a while.